My reading resolutions for this year revolve around a set of too-long-unread books. Many of which were too-long-unread because they are long and complicated. Like Marge Piercy’s Gone to Soldiers and Leslie Marmon Silko’s Gardens in the Dunes, which I have been leaving at home, while these slimmer volumes have been travelling with me. 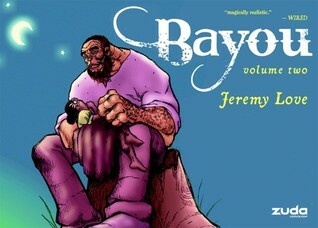 Jeremy Love’s Bayou began as a web-comic and is now available bound, in two volumes, from DC Comics. The stories are set in the Southern United States, during the Reconstruction era, and sometimes the characters are recognizably human, but sometimes they have butterfly wings, and sometimes a grizzly bear wears high heels. Bayou is filled with cotton fields and alligators, corn liquor and chain gangs, dreamin’ root and fireflies, potions and rituals, and witchcraft and stories. 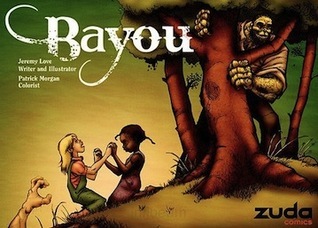 Many readers would expect the volumes to be named for their setting, but in Jeremy Love’s hands, Bayou is a character. Here, landscape is so soaked with memory that it has come alive. Here, bodies of lynched people huddle beneath the surface of the water, bodies of the four-footed and furred are hanging above the soil. Grasping hands might be formed as often from mud as from hatred. And even creatures that appear human might behave in an inhumane fashion; in these stories, a man can swallow a girl whole. Some frightening characters have golliwog and Topsy faces, transforming racist imagery into characters of startling agency. Some seemingly ordinary faces morph into haunting shapes of all-mouths and all-eyes. Some mythic characters appear with a twist, like the female rabbit in her housedress who is bemoaning the absence of her husband, a long-eared Penelope. Panels often directly engage the reader, daring them to face injustices, both historical and present-day. The illustrations are in predominantly sombre and earthy tones, and even when they are brighter, there is often a queer tint to them, as though fermented. Beneath it all, simmers a musicality, like that found in George Elliot Clarke’s luscious prose. This is the sort of storytelling which simultaneously begs for a soundtrack and offers its own — the blues (some truly bright pigments grace these pages). Hopefully a third volume will sustain the high notes alongside the mournful notes; volume two slips back in time to explain some of volume one’s events, and there are obviously many more stories to be told, many layers of understanding to uncover. 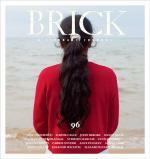 It’s been awhile since I gushed about Brick, but it is still just as gush-worthy in its 96th issue (contents listed here). It is one of those packets in the mail which makes me smile. A cover like this issue’s does not immediately engage my interest, but when I read about Sophie Calle’s work in “For the Last and First Time”, the exhibition from which this issue’s cover photograph is pulled, my heart turned over. That feeling, of being whole-fully and heart-fully surprised by unexpected epiphanies, in works of art and lives of work. And the pages of a magazine spark it. That’s sweet. Next, I turned to the piece by Carrie Snyder “Why Give Yourself Away?” It, like many of the pieces, appears to have elements of fiction and non-fiction; it, like many of the pieces, seems to set such distinctions solidly under the heading of marketing concerns. It feels like the author is giving herself away; it makes me grateful for the giving. After that, I lost track. Because this is one of those publications in which whatever-comes-next is good. It is one of those magazines which I put on the shelves with the books. Brick is one of my favouritest things. How about you: what’s in your bookbag these days? That does sound like a wonderful magazine. I’ll have to look out for it next time I’m at a bookstore, although I wonder if the ones here carry it. I don’t know if there will be a third volume of Bayou 🙁 I heard that there was some sort of issue between the author and his publisher, which is quite sad. But maybe that is old news and everything is good now? I really enjoyed the first two volumes quite a bit. Aw, that’d be disappointing for sure. Because the narrative feels a little episodic by nature (but that lends itself to reading on commutes, or in small spaces of time during a day), I’d really like to have some of the gaps filled (as he managed between these two volumes as well) in subsequent volumes. Hopefully a solution in is the works! I read Mercy first, then Any Given Power, then Effigy, and Fauna. I bet you’d love Effigy. And I think you’re right about the book reference: good memory! I was just thinking about Alissa York’s book, Fauna. I think it was in that book that one of the characters was reading Watership Down (carrying over from your last post). I saw she has a new book coming out! What else have you read of hers that you loved?